The peacock courting the chickens (323/365), originally uploaded by :Duncan. …and the chickens carry on regardless. Different colours correspond to different length scales of the periodic structures. For brown feathers, a mixture of red and blue is required: one colour is created by the periodic structure, and the other is a created by a Fabry–Pérot interference peak from reflections off the outermost and innermost boundaries of the periodic structure. Many colour mutations exist through selective breeding, such as the leucistic White Peafowl and the Black-Shouldered Peafowl. 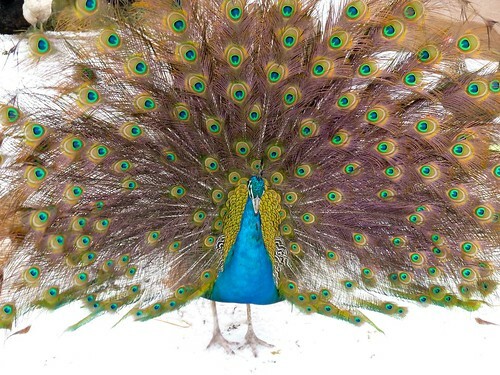 Such interference-based structural colour is especially important in producing the peacock’s iridescent hues (which shimmer and change with viewing angle), since interference effects depend upon the angle of light, unlike chemical pigments.